A few months ago, for the first time in my entire life, I bought a product from Estee Lauder. The grand brand, which owns more makeup lines than you can count, is reinventing itself. Reaching out for younger and trendier consumers, EL recently hired Tom Pecheux, and his upcoming collection has led me to believe I will be buying more at my local Estee Lauder counter. 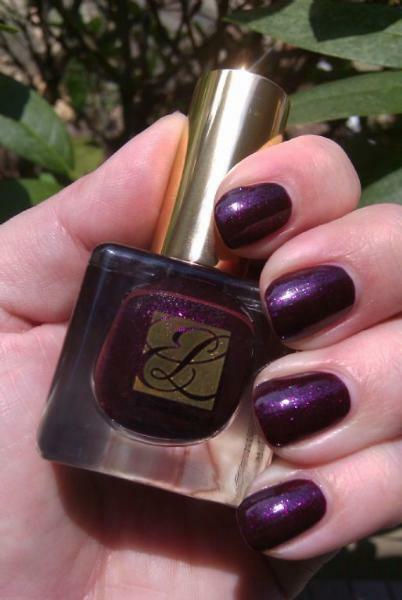 My previous purchase was the sold out Ultra Violet polish, which I wore back in March, pictured below. I have very very high hopes for both the eyeshadows and the nail polish from this collection. It is slated for a "fall" release, which means we will likely see it in July!!! The great thing about EL is that the limited edition products are much much easier to track down than other companies, for example MAC or Chanel. When I bought this polish, it was sold out at Nordstroms, but a local (lower end) department store had plenty in stock. So what do YOU think? Do you own any EL cosmetics? Will you be picking up any from this line?